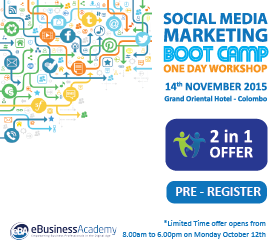 Early this week I shared the news of upcoming Social Media Marketing Boot Camp which happens on 14th November 2015 in Colombo. Yes that’s right. You can buy one ticket to the workshop and bring a friend or a colleague 100% free of charge. This will be a limited time offer open for only a few hours on 14th October 2015, and only for a limited number of seats. You can visit the page http://ebusinessacademy.org/workshops/2in1offer/ on Monday 12th October between 8.00am to 6.00pm and register for this exclusive deal. Yes, you are allowed to share the cost of the ticket with your friend but the payment for 1 ticket has to be made in full within 72 hours of receiving a confirmation of the offer. Want to get notified when the 2 in 1 offer goes live? RSVP yourself on the below Facebook event page or follow the hash tag #BootCampEBA to stay in touch.